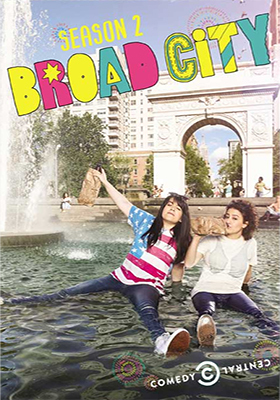 The girls — Abbi (Abbi Jacobson) and Ilana (Ilana Glazer) — are back in town for ten more fun-filled New York adventures in Paramount Home Media’s first DVD release of 2016. Streeting on Jan. 5 will be the double-disc set of Broad City: Season Two, showcasing the often-outrageous comedy stand-up and writing talents of Upright Citizens Brigade Theatre alums, Abbi Jacobson and Ilana Glaze. 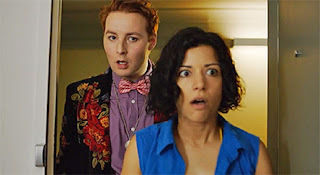 Their inspired web series grew into this marvelous Comedy Central cable series (which has be re-upped for a third season). All ten episodes are “uncensored” and feature such guest stars as Amy Ryan, Seth Rogen, Susie Essman, Aidy Bryant and more. Bonus goodies include outtakes and deleted scenes, plus “Body by Trey” fitness (comedy) videos, “Hack into Broad City” online chats between Abbi and Ilana (comedy promo bits) and “Nicole Memos” (Nicole Drespel’s running gag video diary on Ilana’s DealsDealsDeals office behavior). Damn if the Aussies don’t make interesting films. Especially indie films, there’s always something edgy about the filmmakers and their filmmaking from Down Under. The latest is from writer/director Louise Wadley, who has crafted her filmmaking skills over the past 20 years with documentary and short films — plus some independent producing as well — and now makes the jump to the feature-length arena with All About E.
Wolfe has tabbed Dec. 1 as the domestic DVD debut date for this sweet indie gem. One is immediately reminded of Aussie filmmaker P.J. Hogan’s 1994 film release of Muriel’s Wedding, which made Toni Collette and Rachel Griffiths international stars. That cinematic treasure was a nifty mix of drama and comedy — you are laughing out loud one minute and near tears a few moments later. Wadley captures the same here as All About E swings from the hilarious to the dangerous at a moment’s notice. Our heroine, “E” (Mandahla Rose — Wolf Creek 2), is a somewhat promiscuous DJ at a popular gay nightclub in Sydney, who just happens to be “married” to a gay Irish bloke named Matt (Brett Rogers). As with Muriel Heslop’s nuptials, E’s marriage is a sham as well, but it does serve two purposes — it keeps her family off-balance as to her sexual preferences and Matt is able to stay in Australia (and besides, he’s her personal costume designer). Now even a casual observer could see through this façade. The MacGuffin that rockets this story into high gear is a bag full of drug money, left in the back of a cab by an inept courier, and now in E’s possession. This could solve a lot of problems, but in no time her and Matt are on the run and there is simply no place to hide … except, possibly, the one place where she is not welcomed. Mandahla Rose and Brett Rogers are fantastic. There’s a chemistry between them that makes the writing all the funnier and the gangsters-in-pursuit counterpoint all the more tense in that we have come to like E and Matt and want nothing to happen to them. As to that “place” where they end up, it’s an outback spread run by Trish (Julia Billington). The pair — E and Trish — have a history that didn’t end well. But with everyone’s life on the line some things can be overlooked … perhaps even a flame rekindled. All About E is a wonderful “cross-over” film from Down Under that deftly mixes genres, the direction and writing are solid and the technical aspects (cinematographer and sound) are top-notch. 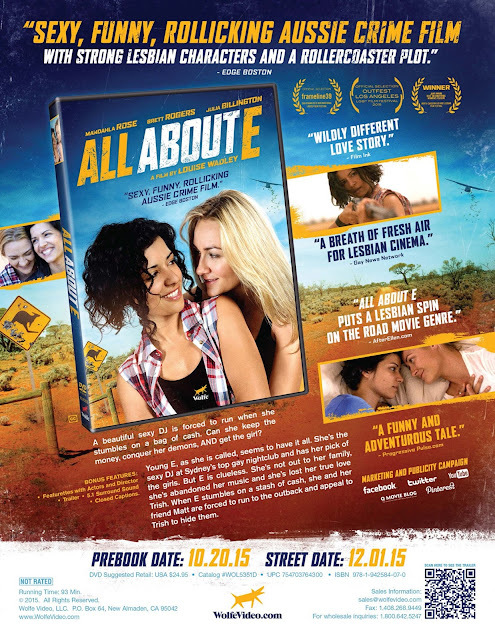 Indeed, All About E could be a travel promo for Australia (come on down, visit the outback), except for those nasty parts where the sleazy drug dealers are trying to kill E, Matt and Trish! Evan (Harry Hains in his film debut) is a zombie. No, not of the undead kind, wandering the landscape in search of its next meal, but the product of a rough childhood and foster care (a half-dozen different homes by the time he was a teen). Those experiences have transformed him into something of an automaton, moving through life alive and alert, but nonetheless cold and distant. 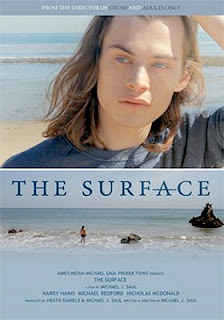 This young man, now in his early 20s, is the focus of writer/director Michael J. Saul’s The Surface, his long-awaited return to the feature-length milieu (Crush released in 2009, followed by a number of award-winning short films since then, including Adults Only and Go Go Reject). The film is in current release on the festival circuit (debuting at Frameline this past June) — however, word arrived this past week from Artizical Entertainment that The Surface will be available for the DVD arena come Dec. 15. As the story begins we see that Evan is in something of a relationship with a young man his own age by the name of Chris (Nicholas McDonald). It is here that Saul quickly establishes Evan’s character — he’s detached, ambivalent, distant, while his partner, of wealth and means, is clinging and needy. It isn’t working, despite the obvious advantages for Evan … it’s an environment that feels cold and sterile and it awakens our “zombie.” There has to be something more than this. This “something” arrives in a most unexpected manner. Evan is simply out and about one sunny day when he happens up a garage sale, a chance meeting with the elderly home owner and the impulsive purchase of an old 8mm camera and a box of films that went along with it. 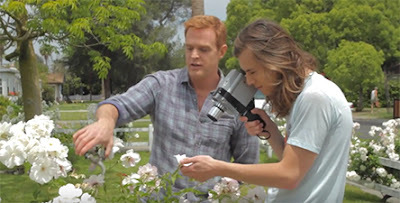 In the context of filmmaker Michael Saul’s cinematography for The Surface, the purchase of this “relic” provides the perfect metaphor for Evan’s path to discovery; an awakening. It’s a simple technology, rough and textured, as opposed to our modern world of mega-pixels and perfect clarity … the world of our zombie. After viewing the films, he returns some time later to the old man’s home, inspired to edit them into a film of his own making. He comes to find, from the man’s son, Peter (Michael Redford), that his father has passed away, but is more than welcome to make use of the equipment in the garage. From the purchase of the camera, to meeting with Peter and what follows, it becomes clear that Evan is discovering something within himself … something that needs to be explored. The Surface is a nice indie film, pleasing to its intended audience, but worth a look from an even wider audience for its structure, camerawork and storytelling. 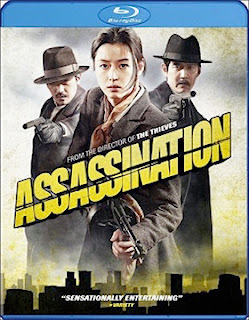 Well Go USA targets Dec. 1 for the delivery of DVD and Blu-ray editions of South Korean filmmaker Choi Dong-hoon’s 1930s-era Japanese-occupation thriller, Assassination. The ARR comes in at 116 and the domestic box office take was an impressive $1.9 million (it was a blockbuster in South Korea during the past year). It can be tough doing a costume/period film. Style, mannerisms, historical accuracy and the mores of the period can all come into play — getting it right can be a bit of a challenge. Dong-hoon handles these issues easily (everything seems to ring true), which allows us — the audience — to focus on the intricacies of the plot, and there are more than a few to twists and turns to keep track of. By 1933, when the action takes place, Korea was well within the influence of the Japanese Empire (a process that began shortly after the turn of the century and lasted throughout World War II). Thus the plot to assassinate a high-ranking Japanese military official by the name of Kawaguchi (Shim Cheol-jong) and a wealthy Korean businessman with Japanese-leanings (played by Lee Geung-young) would be more of a statement than an act that would have any real lasting effect. We said twists and turns. Here we go, the Chinese are trying to keep the Japanese off balance, so they aid the Korean resistance in putting together a hit team in Shanghai that consists of Ahn Ok-yun (Jun Ji-hyun — The Berlin File, Snow Flower and the Secret Fan, Blood: The Last Vampire), Big Gun/Chu Sang-ok (Cho Jin-woong — Raging Currents, The Front Line, etc.) and Hwang Deok-sam (Choi Deok-moon — The Admiral, The Thieves). However, one of the team members is secretly working for the Japanese, who have also put together their own “hit” team, which is composed of Hawaii Pistol (Ha Jung-woo — The Berlin File, The Client, etc.) and Young-gam (aka: Old Man — played by Oh Dal-su — The Host, Old Boy, The Thieves). So let the games begin. Hit team versus hit team, with a ringer in the mix. Assassination is presented in Korean with English subtitles. Every traveler’s nightmare — besides bad weather and a run in with some bad food — is a political crisis that throws everything into chaos. Director John Boorman’s 1995 thriller, Beyond Rangoon, saw American tourist Laura Bowman (Patricia Arquette) caught up in a coup in Burma and spends her vacation time locked in a nip and tuck fight for survival against near impossible odds. Director John Erick Dowdle’s No Escape, which is heading to the home entertainment market place on Nov. 24 as both DVD and Blu-ray product offerings from Anchor Bay Entertainment, covers similar ground and is just as effective as Boorman’s film from 20 years ago. For the record, the ARR is a swift-to-market 88 days and domestic ticket sales currently stand at $27.1 million. 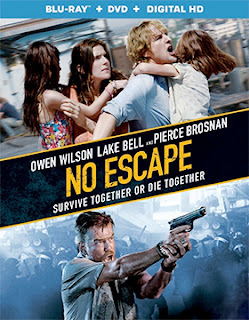 Jack Dwyer (Owen Wilson), his wife Annie (Lake Bell) and their two daughters, Beeze (Claire Geare) and Lucy (Sterling Jerins) lands in an unnamed Southeast Asian country (filmed on location in Thailand) where he has been hired as an engineering consultant. It is a paradise, the people are friendly, including a Brit named Hammond (Pierce Brosnan), who helps Jack and his family get from the airport to their hotel. And then it begins … a rollercoaster ride of death, destruction and absolute chaos. The reason for the coup is a little dicey, but even if it were about a choice between butterscotch and chocolate ice cream it wouldn’t make a lick of difference. 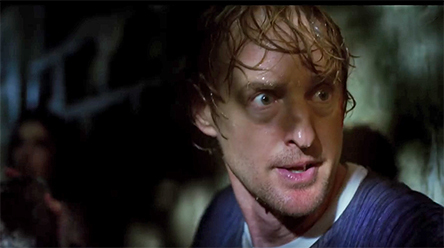 No Escape plays more like a sci-fi thriller with invading aliens killing everything in their path. Jack, on his own, might have a chance of escaping the city and making a clean getaway. With his wife in tow, those chances dim, but with his wife and two daughters, it looks impossible. The rebels immediately execute any foreigners they come across — the hotel is a slaughterhouse as the rebels move from systematically from floor to floor murdering the guests without mercy. The roof of the hotel provides only a temporary respite and the dash to the American Embassy proves to be a dead end (literally). 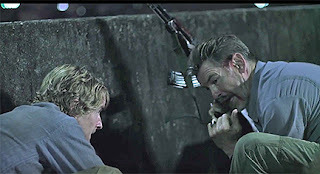 No Escape is tense and riveting, perhaps not in the same class as Beyond Rangoon, but a worthy thrill ride nonetheless. Bonus features include commentary from writer/director John Erick Dowdle (Quarantine, As Above, So Below, etc. ), who is joined by his brother and co-writer Drew, deleted scenes and a Behind-the-Scenes photo gallery. It wasn’t a blockbuster release this past summer, but it was loads of fun anyway. That would be director Aleksander Bach’s debut filmmaking effort, Hitman: Agent 47, which is heading home as both DVD and Blu-ray product offerings from 20th Century-Fox Home Entertainment on Dec. 29. Ticket sales were $22.5 million and the ARR works out to 130 days. 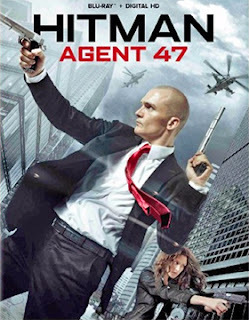 Of course its origins as an action film series (the original Hitman was released in 2007) come from the realm of video games and Hitman: Agent 47 (with a script from Skip Woods, who wrote the original, plus such screenplays as Swordfish, A Good Day to Die Hard and X-Men Origins: Wolverine) plays as if were on a timer … tick, tick, tick; faster, faster; tick, tick tick! Rupert Friend (as Peter Quinn in the Homeland television series) takes over for Timothy Olyphant as Agent 47, an orphan, trained from childhood to follow orders and kill his assignments without so much as blinking an eye or breaking a sweat. As the film opens, an overly friendly “John Smith” (Zachary Quinto, the new Spock from Star Trek and Star Trek: Into Darkness) is able to reach a woman named Katia (Hannah Ware) in a Berlin subway station and rescue her just before Agent 47 is able to assassinate her. Wham! Just like that the film starts. But nothing in these opening sequences are what they appear to be. And that’s all you need to know … the rest of the film’s running time is a total thrill ride. 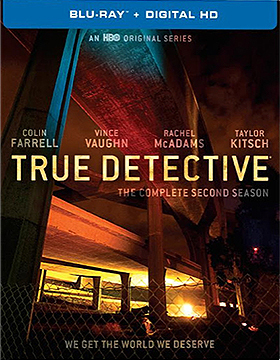 HBO Home Entertainment will celebrate the New Year on Jan. 5 with DVD and Blu-ray sets of its innovative crime series, True Detective: The Complete Second Season. A new case to solve — gone are Hart (Woody Harrelson) and Cohle (Matthew McConaughy), replaced by Detective Ray Velcoro (Colin Farrell), California Highway Patrol motor cop Paul Woodrugh (Taylor Kitsch) and Ventura County CID officer Ani Bezzerides (Rachel McAdams) … three cops, three different law enforcement agencies, all working on the same case of murder and corruption.